Perhaps many times you have spent your weekends in the country to escape the hurried pace of life. Sprawled on the grass you stared at clouds floating across the sky. You could recognize in their pattern the sailing ships, and in the boundless blue sky - the expanse of the sea. 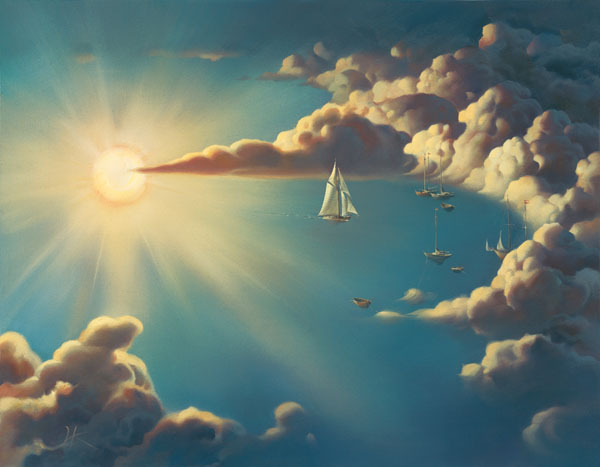 You may have imagined sailing on a ship lit up by the sun so bright and so near to you. Or remembered your childhood on the shores of huge blue lake, when together with a friend you steered the boat to an unknown islet grown over with reed and gave it you name! “What indeed is more beautiful than heaven, which of course contains all things of beauty?” - Copernicus once exclaimed. And maybe now, watching this picture, you imagine yourself navigating the depths of this sky-ocean. The sun which appears to have settled in the ocean is shining to you. Sometimes your ship is maneuvering through cloudy labyrinths. Sometimes she is soaring or swooping down in the blue liquid, diving or rushing forward, to find again and again new cozy havens on the shores of heavenly seas.